Many rappers come many rappers go but only a few have that undeniable staying power. 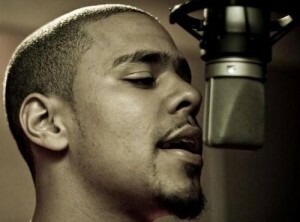 I must say that I am very impressed with the maturity and different variety of music coming from rapper J.Cole. Debut Mixtape: The Come Up- In late 2007 J.Cole release a soulful, energetic mixtape that had a wide range of topics that were very carefree and unscripted. Some songs also touched on the struggle that some people in his community experience day to day. J.Cole has very quickly transitioned from just a mixtape rapper to potentially reaching the “G.O.A.T”(Greatest Of All Time”) status. Now I know it is quite early to make that sort of statement but if you have listened to any of his songs you can hear the passion in his voice. His recently released song “Lost One” goes through an experience of having to make the decision of having an abortion shows his passion about this situation but also his passion about making music. His “Simba” song series keeps avid listeners coming back for more. Brothas what do you think? Is J.Cole the next rapper to take the throne?